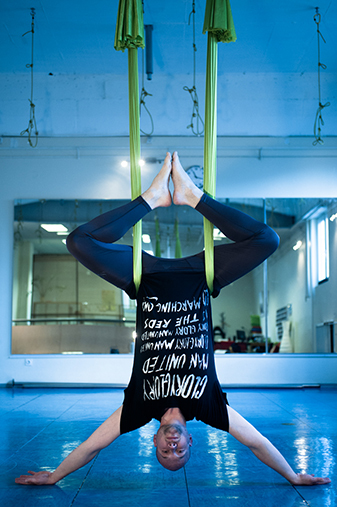 In November 2014, Aerial Yoga has finally arrived at Maribor’s Dance Centre. Our offices are located at Tkalski prehod 7. Marko Urbanek, academic dancer and choreographer, a graduate of the Salzburg Experimental Academy of Dance (modern dance, ballet and yoga), designed the Aerial Yoga program. As a teacher of modern dance, ballet and yoga, he has worked in Maribor and Ljubljana since 2006. Before committing to Aerial Yoga, you can try it out first. To apply, please send an e-mail to aerialyoga.mb@gmail.com.